A spa is a place where spring water or seawater is used to give baths and is believed to be medicinal. Spa resorts, spa towns, and hot spring resorts usually offer a variety of health treatments. Its history dates back to the primeval times, specifically in the Greek and Roman times, and is popular worldwide, particularly in Japan and some countries in Europe. 2 Check Out These Lifesmart Spa Reviews Guidelines! The spa can accommodate 4-person capacity and is built having thermoplastic. It requires less energy for its performance. It is known for being sturdy and keeps the water hot for long periods so that you can take baths for longer periods. It has a portable 110-volt plug and play tub. It has full-foam insulation system, meaning it can trap heat for a longer time. It can be plugged into any standard outlet, so it will be convenient for you. The spa has a digital topside control center for jets, making you control which direction the bubbles would go. It has a waterfall feature, and you can adjust it which way suits you. It has an Ozone water care feature that traps harmful chemicals or debris in the water, keeping it clean for a longer time. It is built using thermoplastic, which means it has the tendency to soften if exposed to too much heat. It only has 20 jets for therapy. Sometimes, we just want to treat ourselves and feel relaxed after a busy week at work. And that is exactly what this Life Smart LS500 hot tub spa is aiming for. Equipped with advanced hot tub spa technologies, you sure can get the relaxation that you deserve. 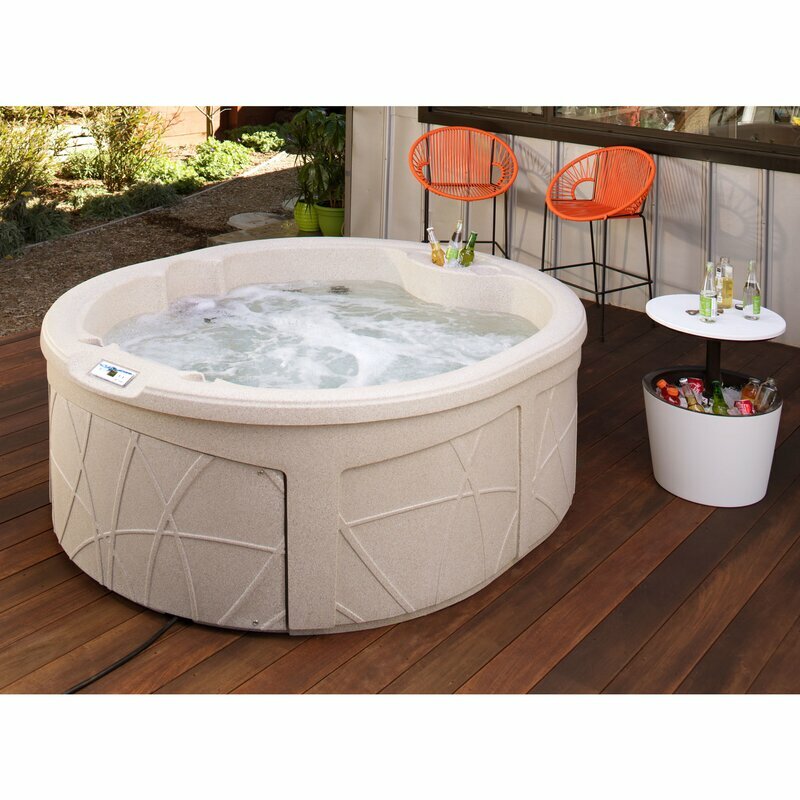 In addition, this hot tub has that classic and elegant feel, perfect for indoor and outdoor spa indulgence. This hot tub has a timeless design that would never get outdated even in the years to come. In terms of water capacity, this one can hold up to 290 gallons, not much but enough for small families. Plus, its LED lighting system has various colors. Did you know that lighting also helps enhance our mood? So, if you’re feeling tired and stressed, turning on the lights as you soak the tub can lift up your mood. It has a total of 23 water jets placed in locations that target the body parts that need hydrotherapy massage the most. With a built-in ozonator, the tub can clean and sanitize its own and the water inside. It also has a locking thermal cover and foam insulation that keep the heat much longer. If the users have bigger body structure, this can only accommodate around 3 to 4 people. It’s a bit expensive, but for the quality and performance of the product, we say it’s worth it. 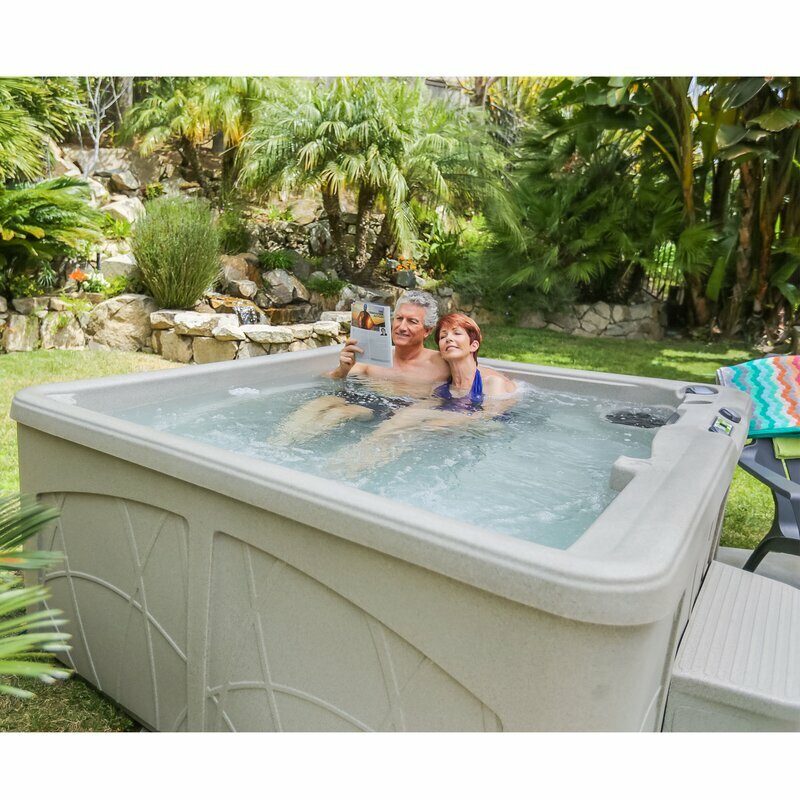 The Lifesmart Retreat DLX 5-Person Spa has a lot of upgrades. It has notable 28 jets and still has a 110-volt Plug & Play spa. It also has an exceptional seating plan, which makes it chic and fashionable. It has 3” thick hardcover, which makes it more durable than other tubs mentioned above. It has an Ozone Purification System, which eliminates 75% of harsh chemicals in the water and maintains the water, making it clean and safe for you. It has a luxurious digital control that makes it stylish and user-friendly. It has 6-color digital light. Lighting can set the mood up for relaxation. It is safe to use with an extension cord. It has a unique seat plan that makes it extraordinary from other tubs. The heater is not included in the package, so you will have to buy a separate heater for it to function well. The filter is not included, so you have to buy a separate filter to drain the water. There are no steps included for this spa. Need a hot tub that can accommodate more people? No worries, Life Smart Spas has got you covered with this 7-perosn hot tub spa. Introducing the Life Smart Coronado DLX 7-person Hot Tub Spa. This is a modern hot tub with amazing features including waterfall jets, ozone system, and LED lighting. This is a hot tub spa with a smart design for 7 people. You can easily control the heat temperature, the water jets, and the LED lighting through its digital topside control. To maintain the cleanliness of the water, it has its own sanitization system though its built-in ozonator. You can enjoy a long-lasting heat therapy as it can retain heat well, thanks to its locking thermal cover. It is also proven to be an energy saver by the California Energy Commission. The installation has to be done by a qualified electrician. Its pretty expensive, but you know it’s worth it, knowing the features it has. The Lifesmart Luna Spa, a 3-4 people deep bucket seats spa that offers great accessories and ease. It is a 110-volt Plug and Play Spa that keeps it easier for installation. Lifesmart Spas full foam insulation system and 3-inches thick energy-saving spa cover are intended to save money by involving less energy and not sacrificing the quality of its performance. It has a digital command which features spa light with changeable mood lens cap. It adds mood to one’s relaxation. A lock kit is included in the package. It can help you maintain the spa for longer use. The spa has 13 jets, including 2 Vortex jets. Vortex jets make a whirlpool in the water. Just like the first spa mentioned above, this spa also has a heat recovery system to maintain the temperature of the water. The spa can be used as cold in summer and hot in winter. It makes the spa usable for the whole year round. Once the temperature setting has reached, it will automatically shut itself so that you don’t have to worry about monitoring its temperature. You just have to dig in and relax. The filter is not included, which makes it hard for water removal. You have to buy a separate filter. The waterfall is not included. Waterfall can make you feel that you are standing in a natural waterfall, and it can also make you feel relaxed. It cannot be used with an extension cord, so be careful when setting up. 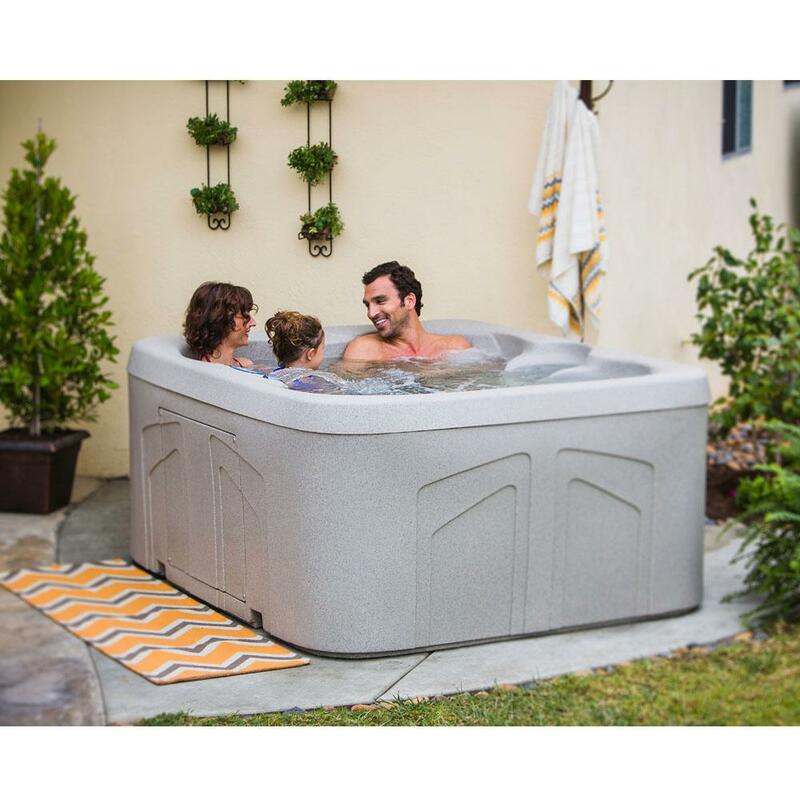 This LifeSmart 3-4 Person AquaSpa features multi-layered PVC and offers soothing bubble massage from its 90 air jets. It is an inflatable hot tub. However, this is for seasonal outdoor use only and shouldn’t be used in temperatures below 40 degrees. It has 90 air jets that provide extreme therapy. Jets can move the stream of water in different directions which can massage your body and relieve soreness and back pains. It has a carry bag to transport the spa. Since this is an inflatable spa, the bag can help you transport the spa in places that you want. The spa has a heat conservation function, which makes the heat of the water last longer and can make you have longer bath time. It also has an inflation kit to help you set the spa easily. The cover is made of Polyester PVC. It makes the product resistant to dirt, and UV rays. It also includes a drain hole, making it easy to remove water from it. This is for outdoor use only. So, if you want to buy a spa that you can use inside your home, this is not what you’re looking for. The temperature should be below 40 degrees. One must make sure to monitor the heat of the spa. The spa is limited to 3 to 4 persons only. Check Out These Lifesmart Spa Reviews Guidelines! In choosing the right tub, you should be selective specifically with regards to the appropriate size for your body and also for the location where you’re going to designate your tub. Size matters for it also sets the mood for relaxation. If one uses a tub that’s too small for his body size, it would lead to being uncomfortable during bath time, and the main purpose of relaxing would be neglected. Remember, your main goal in having this tub is to relax. To some people, they would look primarily at how much it would cost them. They like cheaper deals. Who wouldn’t like cheap products? However, it is also practical if one would do research about the product that they will purchase. Don’t hesitate to ask questions about the product and decide if the price is reasonable enough for you to buy it. In the market, appearance has a great impact in almost all the products. It’s what the customer sees at first hand. Is the style of the tub intended to be outdoors? Is it for indoor? Is it a style for the challenged individuals? If, however, one is limited for movements then it’s better to have a walk in tub. One should really be specific on what he/she wants or how it suits him/her. This all goes down to one’s need and preference. Features are important in selecting the tub you want. It talks about what things or capabilities the tub has to offer like a shower head, lights, hot tub ozone generator, and the like. Some even like to have bathroom scales readily available near their hot tub. Moreover, are you specific for its digital controls, lightning, or jets? Tubs nowadays have their high technology features that would surely put you in awe and will make you want to have one inside your house or your patio. There are a lot of reviews out there on the web, and all of them seems to have totally the same features, making it hard for the customer to choose what to purchase wisely. Nevertheless, all the products mentioned above have their own unique capability, and they are all built by LifeSmart. As mentioned earlier, it is a company that is renowned for its quality spas and uses ECO SMART technology that passed the California standard for spas. Hence, all the five products reviewed are of best quality. One stood out for being an all-in-one package – the LifeSmart Hydromaster DLX 7. It has all the features that can make you achieve the relaxation and pampering you need when taking long baths. It’s stylish and big enough to accommodate seven people. It has the biggest and most efficient pump than all the other products. It’s not only stylish, but it can be good for one’s health for it has ozone generator that filters debris and harmful chemicals. Thank you for reading, and I hope you find this review helpful!